We are getting very close to finishing planting peanuts. We are still planting some this week. 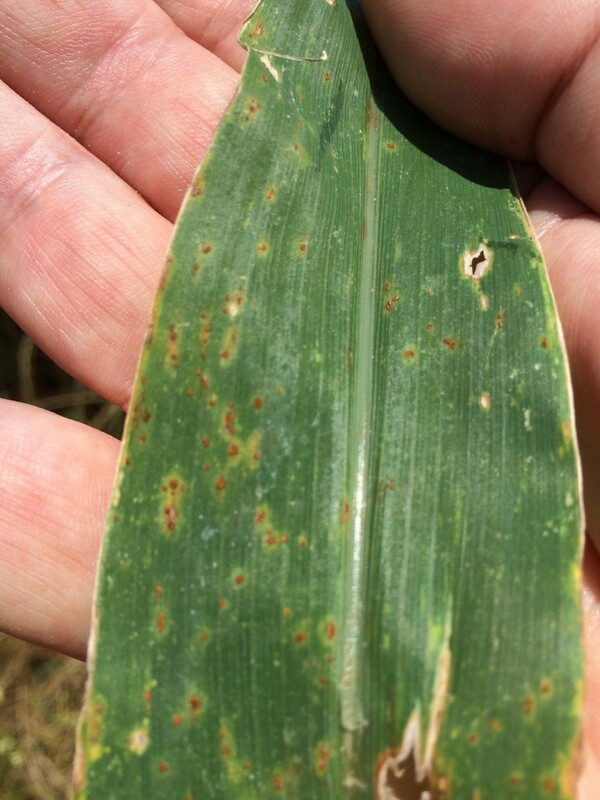 The last few weeks, we have been monitoring thrips very closely. We have also been spraying our cracking herbicide sprays. Here is a twin row field of 06G planted at 7 seed per foot, and having a tough time getting a stand. There is plenty of moisture here and some seeds have rotted in the ground. We are good at 2 inch depth. In some spots we are a little deep. Plants have a hard time getting up from below 3″ for sure. We’re getting 3.5 to 4 plants per row foot here and there are some skips. Do we need to worry about replant? UGA Peanut Agronomist Dr. Scott Monfort says if we are at 2.5 plants per foot, and no skips, we are okay. The only skips in this field are on one side of the twin. This we are not worried about since we can compensate from the other side. Replanting did not improve yield over leaving a poor plant stand as often as I would have anticipated. Overall, only when plant stands were as low as 1 plant per foot of row did replanting improve yield at a point that it would be economically viable to justify the cost of replanting (because of the additional cost of seed and fuel/labor/equipment expenses to move across the field again). Although, some of the individual year data did show the potential for yield improvement when plant stands were 2 plants per foot of row or less. 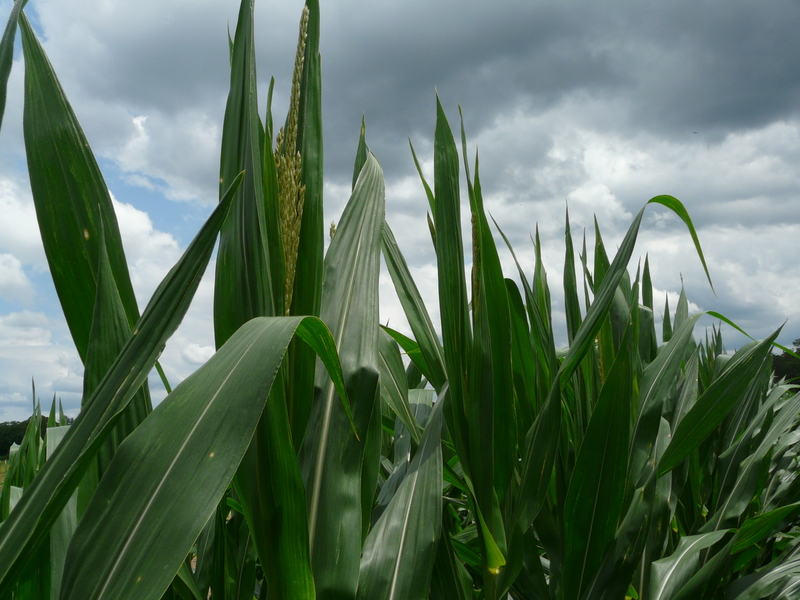 Hence, if plant stands are at least 2.5 plants per foot of row (whether twin row or single row; strip-till or conventional tillage; and the stands are relatively uniform without large gaps in the field), the chances of gaining a return on the investment of replanting a field is very low. 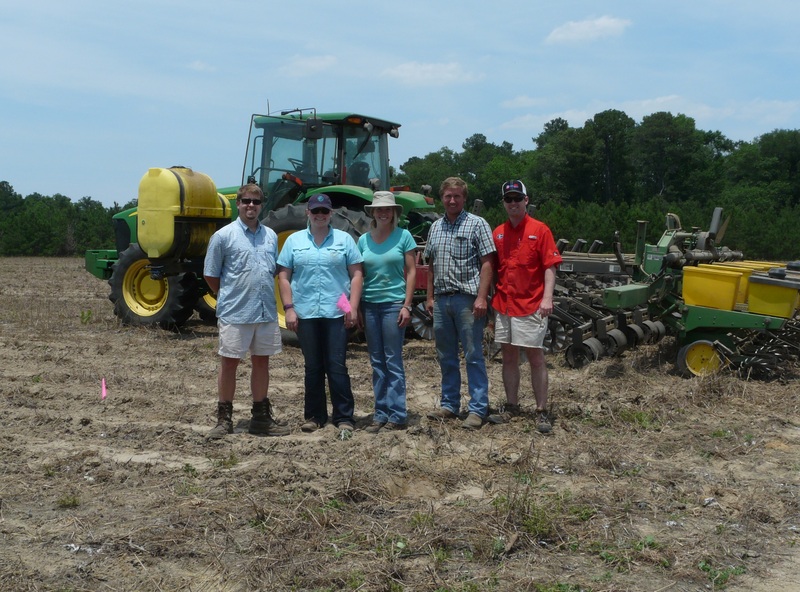 The method of replanting the field does matter as well – there were essentially no circumstances where burning down the original stand of peanuts with herbicide and starting over with a complete replanting of peanut was worthwhile. 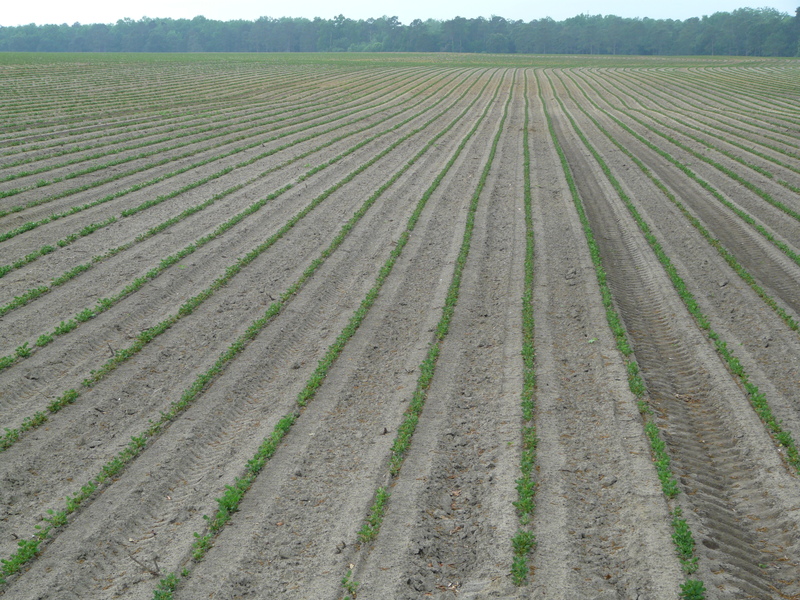 Any instances where replanting showed the potential for a benefit, it was when the poor plant stand was left in the field and peanut was replanted by offsetting the planter a couple inches to the side of the original row and placing supplemental seed in the ground. 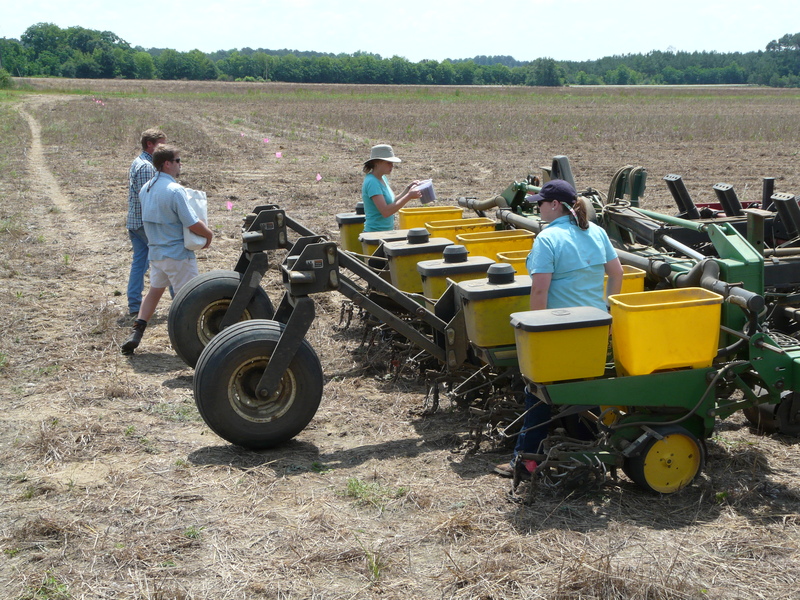 Additional experiments are being conducted to determine the effect of less uniform plant stands with varying gap sizes within the row, and also the timing of determining optimum maturity when the original plant stand and a replanted plant stand are growing together in the field. One thing that was clear in our data was that if a replant decision was made, that decision needed to occur within 2-3 weeks after the original planting date. Waiting until 4 weeks after the original planting was unsuccessful in gaining an advantage over leaving the original plant stand alone. Can we mix orthene with our cracking treatments? Generally, there should be no major problems mixing Orthene (acephate) with paraquat cracking treatments (Peanut Science 2014 41:58-64). What rates of Basagran + Ultra Blazer are used to make Storm? UPI is in a sold out position for Storm 4SL herbicide. However, Storm is in UPI’s production schedule for next year. No worries though since growers can make their own Storm if need be. 1.5 pt/A of Storm would be equivalent to 1 pt/A of Ultra Blazer 2SL + 1 pt/A of Basagran 4SL. FYI, when making your own Storm cocktail for mixing with paraquat, I prefer 1 pt/A of Ultra Blazer + 0.5 pt/A of Basagran. 0.5 pt/A of Basagran still helps “safen” the peanuts but this new ratio will be slightly more active on the weeds. 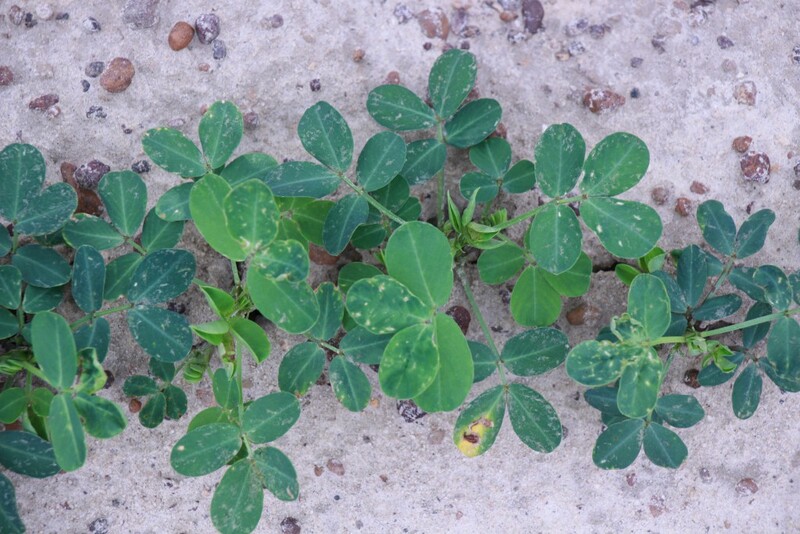 What issues will we see with Valor injury on peanuts? Guess what? When it rains on peanuts that were treated with Valor, especially at cracking, you get crop injury. It happens all the time, regardless if they were irrigated immediately after application or not. Unless something funky has happened (i.e. sprayer problems, excessive rates, misapplication, etc. 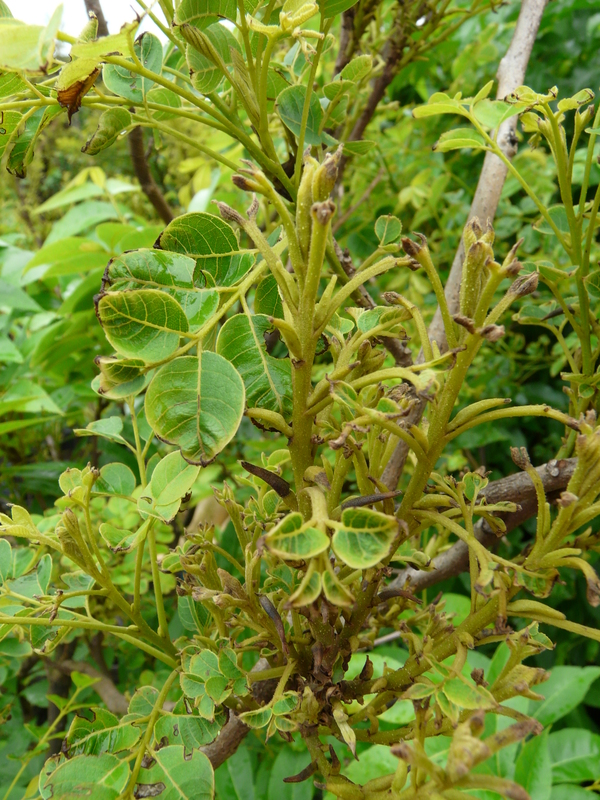 ), research results and on-farm experiences since 2001 would suggest that is very likely that the peanut plants will recover from Valor injury with no yield loss. Mouse ear is a growth abnormality from a nickel deficiency in pecan trees. This disorder occurs mostly on newly transplanted trees in established orchards. This is the first time I’ve seen it, but it is close to the text book pictures and easy to ID. Mouse ear first appears on the spring growth flush. The most common symptom of mouse ear is a rounded or blunt leaflet tip. Other symptoms include dwarfing of tree organs and necrosis of leaflet tips. The degree of severity with the tree canopy typically increases with canopy height. 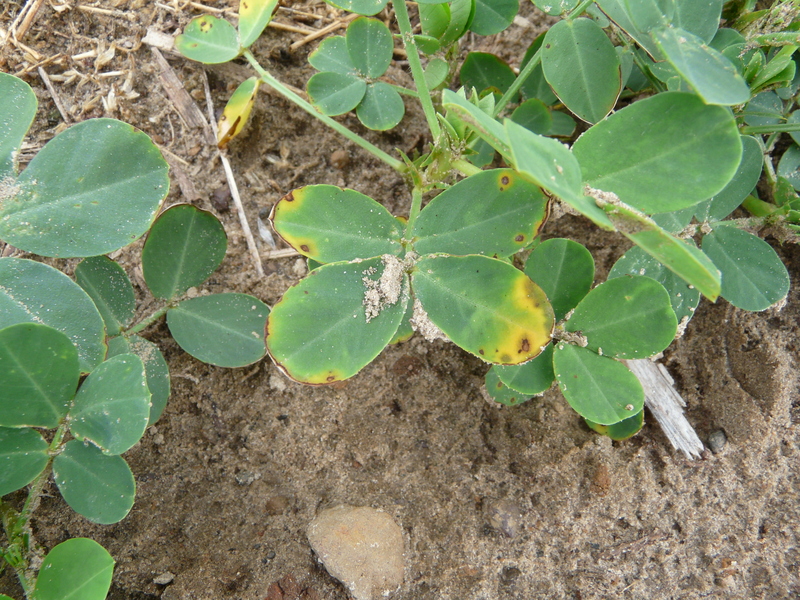 Necrotic leaf tips due to build-up of lactic acid from Ni deficiency. 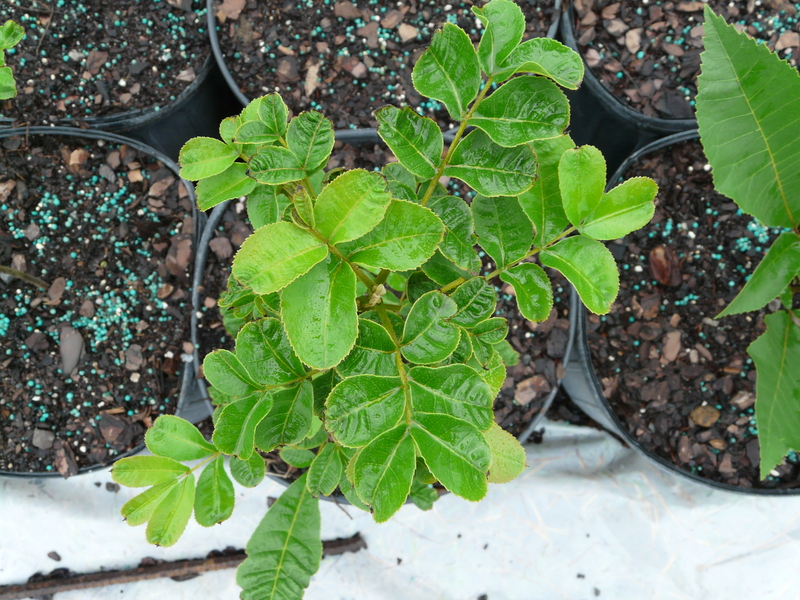 There are 4,000 seedling trees in this nursery and probably half are affected by the Ni deficiency. At this point we need to spray a foliar application of nickel now and again in one month. UGA Pecan Horticulturalist Dr. Lenny Wells says mouse ear may consistently reappear from year to year, or appear on occasion. For mouse ear prone sites, it is recommended to have a foliar spray of nickel in med-late April when leaves are in the parachute stage. (Ni is not absorbed in the plant until leaves are in parachute stage.) We follow up with an additional application in late September or early October to prevent mouse in the following spring. Monitor leaf and soil samples for availability of Ni to trees. 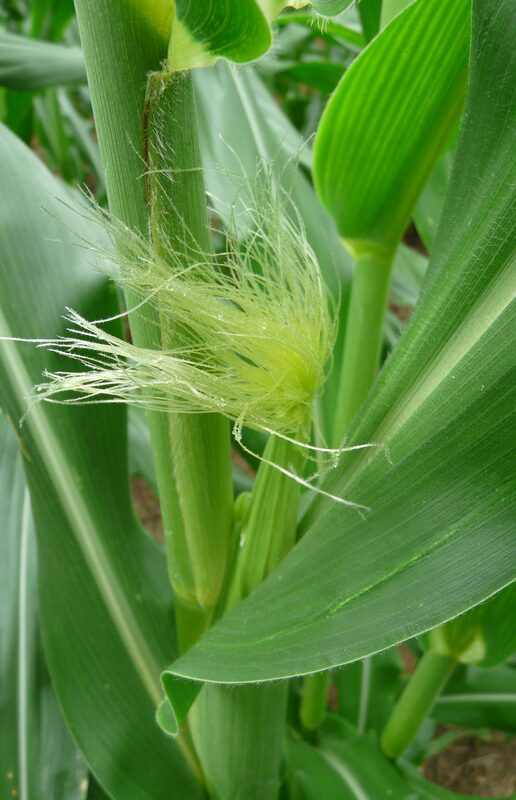 Maintain good soil moisture at budbreak. Ni is relatively low in the soil in most orchards, and it is absorbed by the tree in the lowest of many nutrients. Maintain soil pH at 6.5. 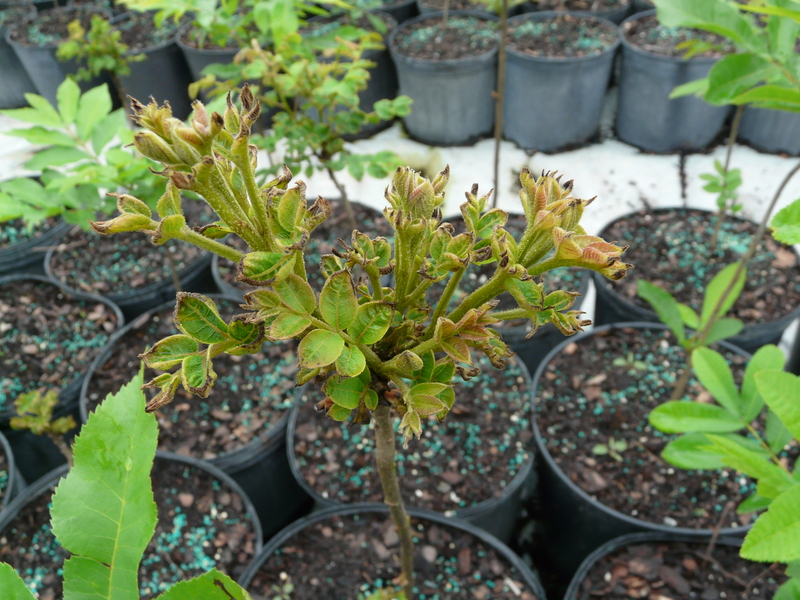 Do not give late applications of N, to ensure that senescing foliage can translocate to shoot and bud storage prior to defoliation. Manage phosphorus, iron, and copper levels in soils. These nutrients affect uptake of Ni. They may also alter the availability of Ni within the leaf. Rosetting and necrotic tips from Ni deficiency. If replanting cotton is necessary, one needs to consider the herbicides used in the original planting. Cotton is tolerant to the herbicides we use pre-emerge in cotton, with the exception of Warrant and Warrant Extra. Over time the active ingredient (acetochlor) in Warrant is released from the capsules that make it safe at planting. Once released, it can be very injurious to cotton. Cotton can be replanted 2 weeks after the original application if the land is strip tilled with ripper shank, before replanting. This will dilute the acetochlor. If no tillage is performed, wait 3 weeks before planting. Strip tillage: Rerun the strip till rig which should include ripper shanks followed by planting. 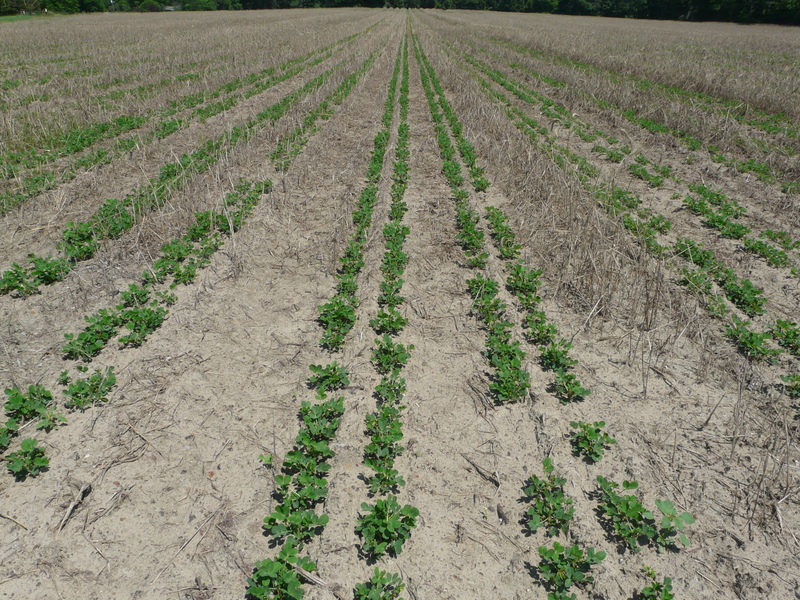 After replanting, apply a PRE herbicide mixture that includes both a non-selective herbicide to control emerged weeds/cotton and a residual herbicide. The residual herbicide should be different chemistry than that used with the original planting. It is likely the residual herbicide used with replanting may offer limited residual Palmer control; thus, the first early POST application must be made quickly after replanting in a Roundup Ready system (likely 10 d or less). Conventional Tillage: For growers who do not have strip tillage implements, use shallow tillage such as light disking. Do not re-bed without first disking. Re-bedding without disking can lead to severe injury. The amount of time that has passed and the amount of rainfall that has occurred between herbicide applications and replanting will determine the need for additional herbicides.In general, additional herbicides will be needed when replanting but one should switch residual herbicide chemistry from that used during the first planting. Glyphosate, paraquat, or Liberty must be included to control emerged weeds and cotton when replanting. Paraquat (Gramoxone, others) or Aim will control small emerged cotton. Liberty is also effective controlling cotton as long as it is not a cotton cultivar tolerant to Liberty. If you are seeing a lot of adult thrips on seedling peanut AND no at plant insecticide was used, it is time to spray. 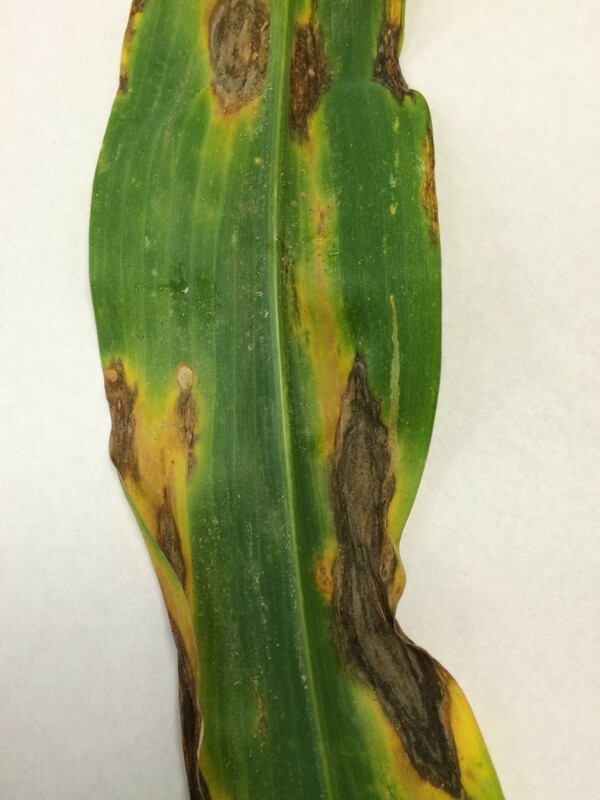 We could spend lots of time debating about the perfect timing, and in theory it would be best to wait until you see immature stages before making a treatment… In the real world in 2016, there are probably immature thrips in the field already, and waiting to treat will just increase the amount of damage you are going to see next week. If we wait until after the terminals have turned brown to spray, we have not done ourselves any favors. The decision to over spray a field that was treated with an at-plant insecticide is not so easy. We almost always see some adult thrips in our plots regardless of the treatment; this is especially true while the thrips flight is active (as it has been for a couple weeks). 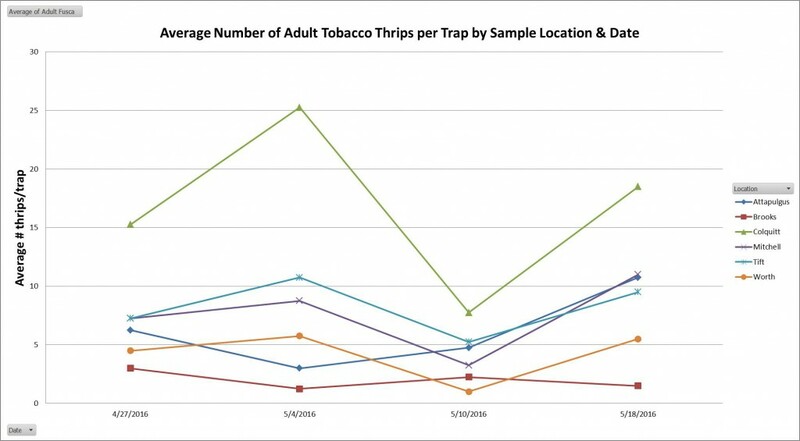 So, how do we know if those adults are going to die or survive and make more thrips? We do not know for certain, and that is why it is difficult to make a management decision. I rated my earliest planted thrips trial on Tuesday of this week (planted 29 April). Damage ratings in the untreated plots were similar to what I have seen in previous years during moderate to heavy thrips flights. With the number of adults and immature thrips I saw on Tuesday, I would expect damage to progress rapidly over the next seven days. 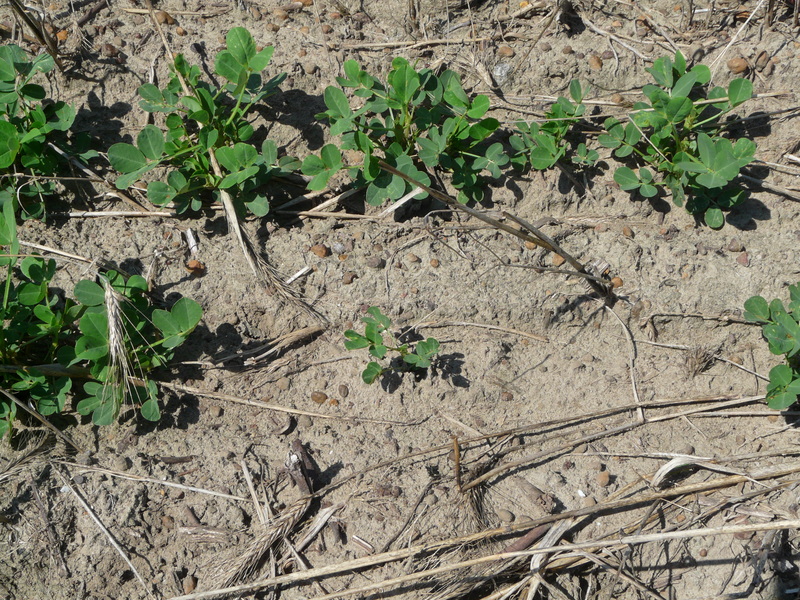 In the (above)picture of untreated peanut seedlings, the terminals appear green and relatively healthy. Next week’s picture will probably tell a different story. The good news is that we are finally getting some rain. Fields treated with Thimet are showing thimet burn following rain, which is a physiological response to the chemical in the plant. 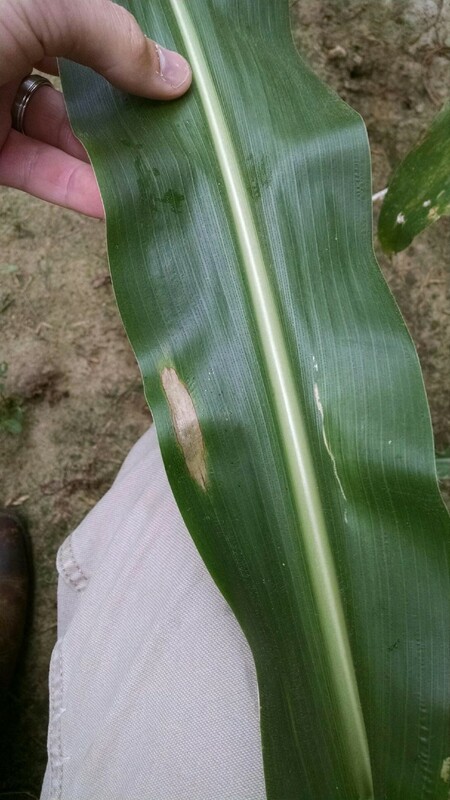 I was also seeing some leaf tip burn of terminals were thrips were feeding. They of course have to feed on the leaves before dying. Dr. Abney said our at-plant insecticide fields and no insecticide fields actually look the same this week. However, in a week’s time, our no insecticide fields will look hammered – since the thrips are feeding AND reproducing down in the terminal. At-plant insecticide fields will hold out much longer with only adults feeding.